Things handmade have increasingly become products from overseas. You see it most often in home décor items made in Mexico, Iran, Korea and China- most anywhere but in the U.S. The story of material and its fabrication is an ancient one and has its roots in far away lands. Maybe we’ve returned to that time. Or not. 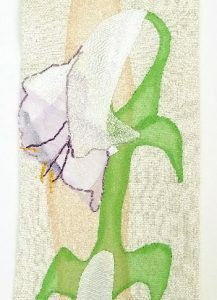 A lily overlay I made for a custom stole. The art of decorating fabric, or embroidery dates back to 30,000 BC- also known as the Cro-Magnon period, in southern France. Drilled shells stitched with decorative designs on animal hides were discovered in Siberia around 5000 BC. Some of the finest silk rugs from India have 2400 knots per square inch. Chinese thread embroidery dates back to 3500 BC. If you had means, you might have also have had clothing embellished with precious stones and pearls. Love that idea! More on the history of embroidery here. Much early fabric decoration had utilitarian roots to cover up holes and extend the life of a piece of clothing. I was one of seven girls in my family and we sewed from a very young age. Some of that was repair. Most of it was fun, discovery and the personalization of own selves. From doll clothes to our own clothes. (I’ve now sewn both of my wedding dresses) Very different of course. The second time, my son knitted my bolero from home grown CT yarn. Most special, and a family tradition. I still remember in high school I had just finished a special dress and accidentally cut a hole in its lining. I quickly stitched up a flower to cover it. I thought it pretty, but really, it was a repair! Ever darn a sock? We did all the time, using a light bulb to hold the hole open. I simply can’t remember when I stopped. Been a long time! I lifted an image from pinterest. Ah, memories. There was also tremendous satisfaction in completing a repair. It had many benefits, sock improvement, warm feet and. skills testing. Notice the green base material- it’s all handmade! 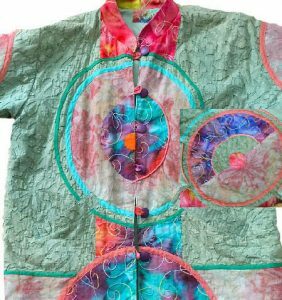 I’ve always greatly enjoyed working by hand, appreciating the consideration of various decorative elements like bias tape, embroidery floss and buttons in relation to the colors or textures needed to complete it. As in a painting. The primary fabric I chose for one of my coats was handmade-layered cotton from India. I added a selection of colors and materials to add greater interest. Vintage Boro clothing from Japan celebrates long-lived fabric. Fascinating. Cotton sateen has always been a favorite of mine. I’ve incorporated it a lot especially when bright colors were important. (always) Many years later, I discovered how well cotton sateen takes a photograph. Paola Pillows were born. Cotton is a fascinating medium. It also washes so well, I think I prefer it after a period of time when it feels its age. Besides, who doesn’t love clean pillows! 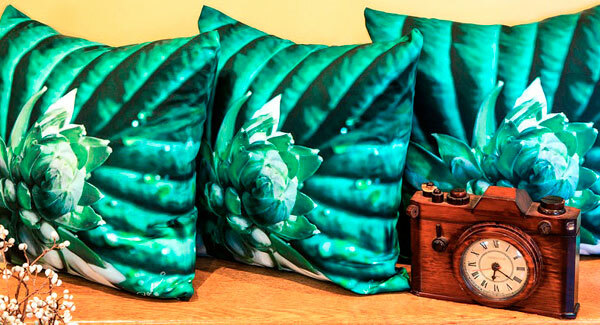 Paola Pillows are designed, printed and sewn here in the US. 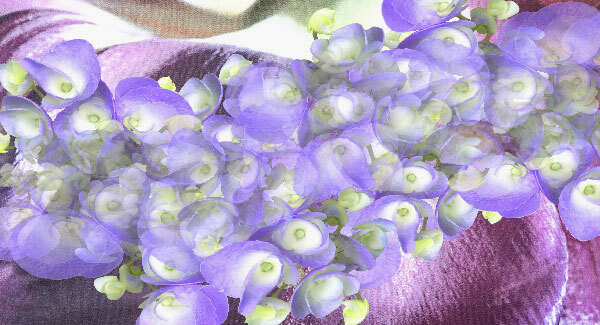 Most of them are created from photos of plants I grow myself. Hosta leaves! You can see more pillows here. Musicians are as varied as excellent handmade crafts from far away lands. Consider Jamaica and Italy. You couldn’t find two singing styles more different. I’ve picked two extreme artists, both extraordinary. Jamaican Musician, Brushy One String and his version of Chicken in the Corn. Wild. More about Brushy here. Second but not least, my most favorite tenor, the unforgettable Luciano Pavarotti in Nessun Dorma -from the opera Turandot. Subscribe here. Talk with you soon!